I often get emails from people who are finally ready to face their debt but don’t know where to start. Here’s a quick one I received from a reader recently. I really need your help and advice. We are in debt and it seems to be growing. We are struggling to make it every month. I would love to have your help! 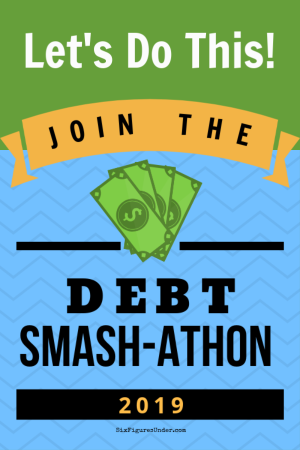 Just taking the step to come out of debt denial and start facing your debt is a big deal! There will be a long road ahead of you, but you can do this and it will be so worth it! While I have many articles and debt discussions about specific areas of debt repayment, I wanted to specifically address and give guidance to those who are just starting on their journey to be debt-free. I would love to hear everyone’s input in the comments. Find out how much you actually owe. If your debt is spread out across multiple debtors, get all the details in one place. As hard as it may be to open up all your accounts and face the total of what you owe, it is essential to know what you are up against. You’ll want to find out your total debt as well as your total monthly minimum payments. Make sure you can cover the minimum payments. It’s important to pay at least the minimum to avoid penalties. Assuming you have more than one debt, you will want to focus your best effort on one debt at a time until it’s eliminated, but you’ll need to pay the minimum on all of your debts each month. Before you go any further, you need to assess the money you have coming in and going out. Do you know exactly how much income you have? Do you know exactly how much you are spending? If you aren’t currently tracking your spending, it’s time to start. You can sign up for Mint.com (it’s free) to start tracking your spending. While Mint is fine for tracking your spending, YNAB is a much better method for budgeting. If you are spending more than you’re making, you are digging yourself deeper into debt. Find the leaks in your budget and fix them before you move onto making a plan. You may have to make some sacrifices, but it will be worth it! Once you have made sure you have a positive cash flow, you can make your plan of attack. If you just have one debt, it’s easy to know where to start, but if you have multiple debts, you’ll have to decide where you want to focus your extra attention. The most popular method of paying off debt is the debt snowball method. The idea behind the debt snowball is that you focus on paying off one debt at a time (but continue to pay the minimum amount on all other debts). Then once one debt you are focusing on is paid off, the payment that you were putting toward that debt will be added toward the next debt you want to tackle. Just like a snowball, your payment will increase rapidly in size and momentum. The big decision to make is the order that you want to pay off your debts. You can choose to start with the smallest amount of debt or you can start with the debt with the highest interest rate. Sometimes the idea of ordering debt by the amount of the debt is specifically referred to as the snowball method, though both methods are actually variations on the snowball debt payoff method. One way to increase your debt payoff momentum is to focus first on paying off the smallest debt first, no matter the interest rate. You make minimum payments on all debts, and any additional funds go toward the smallest debt you have. When that smallest debt is paid in full, you take the monthly payment that you were making toward that smallest debt and add it to the next smallest debt. The main reasons for choosing the snowball method are to feel success and keep momentum up. If your smallest debt is not your highest interest debt, you may pay more in the long run than with the debt avalanche method, but with the debt snowball you can focus on a quick win to start your momentum. Ordering your debt by starting at the greatest interest rate is sometimes called the debt avalanche method. You will start with the loan of the highest interest rate, no matter the size of the loan. You still pay the minimum on all of your loans, but you put all your extra toward the loan with the highest interest rate. Using the interest rates to order your debts will save you more money in interest, especially if some of your loans have much higher interest rates than others. If you aren’t worried about having some early psychological wins, then this is the most logical mathematical option. While the plan tells what you are going to do, a goal says when you are going to do it. I like setting a debt-free date as a long term goal to work toward. In addition, smaller goals along the way are essential to keep you going. Keep in mind that a goal needs to be something that you can measure and track. You can make a spreadsheet to keep track of your balance, minimum payment, actual payment and interest rate, which will help you decide how to start on your plan and let you measure your progress. Keep track of your progress and stay on top of your goal. Work really hard to speed up the process. Now that you’ve made the decision to tackle your debt, don’t slow down. The faster you can pay off your debt, the less you’ll pay in interest and the sooner you’ll have a fresh financial start. To speed up the debt payment process do what you can to make more money and spend less money. Consider ways you can earn extra money. Do what you can to lower your bills. For example, if you’re paying more than $10/month for your cell phone, switch to Republic Wireless. Decide what you are willing to give up to be debt-free. Don’t give up! You can do this! Let others know about your plan so you can have some cheerleaders. Realize that it usually takes longer to get out of debt than it took to acquire the debt. Fight off discouragement when you’re feeling overwhelmed. You can do this! The most common question I get from blog readers regarding finances is “Where do I start?” I’ve noticed that, no matter what the specifics of the person’s financial situation, my response to the question of “Where do I start?” has often been quite similar. Over time, those responses have expanded and evolved into the basis for my ebook, Frugal Fresh Start: A 28-day challenge to trim your expenses, build your budget and fix your finances. My goal in writing Frugal Fresh Start was to help people know where to start and to give clear direction and goals for getting their finances in order. At 130-pages, Frugal Fresh Start is thorough and loaded with substance. It’s not meant to be read in one sitting. Frugal Fresh Start is divided into 28 chapters to be read one day at a time. Each day includes an actionable challenge so you can make the day’s principle work for you. Because the challenges are designed to be customized to your situation, you don’t have to get frustrated with challenges that are either unattainable or too simplistic. To put it simply, Frugal Fresh Start is 28 days packed full of real-life strategies to reach your financial goals by lowering your expenses and making the most of your hard-earned cash. By the end of Frugal Fresh Start, you will have trimmed your expenses in effective and practical ways, leaving money in your hands. Those savings will no longer get lost in the shuffle! With your new budget, built especially for your personal style and financial situation, your money will be actively working to help you reach your goals and tackle your debt. If you are ready to make financial strides and turn your finances around, then now is the time to take action. Finances don’t just fix themselves, you know. Begin your Frugal Fresh Start today! What advice would you offer to someone who is just starting their debt repayment journey? What did your plan of attack look like? Awesome post Stephanie. As I worked in the debt relief, personal finance management sector in the past, I can say that finding out where to start seems to be the hardest thing for a ton of people. This outline is a great way to go! Thanks for sharing, I’m sure it will help the masses! Thanks JRod. I agree– starting is the hardest part! I think the most important thing when starting your debt free journey is commitment. I have a ton of people “say” that they would love to be debt free, but wont take the necessary steps. It takes commitment to stick to the budget each month. I takes even more commitment to turn down a friend when they want to go out for a drink when you don’t have money, or pass up that awesome sale on a blouse, or tell your kids no to a toy. Secondly, I think it is important to be honest about your situation. When we were putting large amounts of money to our debts we would have to tell friends often we “didn’t have the money” . Most friends understood and would change plans accordingly. Other friends we lost, but that was ok. We like surrounding ourselves with budget-minded people. That’s so true CeCee! Commitment is crucial! If you aren’t committed to getting rid of your debt once and for all, it would be so easy to give in when things got tough. That’s great to hear that the psychological win was so effective for you! I’m going to second everything in your post and of the other commenters. Getting started is the most difficult part. And with couples, it’s hard to get started unless you have full commitment from both parties. I hadn’t heard the difference between the debt snowball and the debt avalanche before. You did a great job synopsizing the two different approaches. Thanks for sharing your inspiring experience Jessi. It’s amazing what you can do when you get your mind to something and focus! For me, finding out how much I owed (opening all those bills and adding it all up!) wasn’t just the most important factor in starting my debt repayment journey; it was actually the scariest too! I could kind of deal with budgeting and giving up some of my spending but finally putting on my “big girl pants” and accepting just how much I owed scared me silly! It took literally days the first time to finally pluck up the courage to work out just how much of a hole I was in! Yes! That was a painful realization for me too. I knew we were building up debt from our student loans in law school, but I was afraid to see the total while we were in school. When I finally mustered the courage to checkout the total it was even more than I thought. I wished I had opened my eyes sooner! I’ve only recently discovered your blog because we’re just starting the aggressive debt pay down process (we’ve been slowly paying down student loans for years but only now are getting serious). How fitting that I began reading with this post! These are great tips to help us get started. Now I’m going to go binge read the rest of the blog, we have a really similar story getting into debt story with law school for my husband while we lived on my grad school stipend, so I think we’re going to benefit from all that you’ve learned in this journey. Congratulations on your progress thus far! Hi Judi! Good for you for getting serious about paying off your debt! Deciding to start is a big step. And how fun that our stories are similar! We paid off all of our credit card debt by using the snowball plan. We also cut back on everything…going out to eat, movies, groceries, buying anything new and anything else that was not needed. For the two years it took as we took every penny and put it toward our debt. At times it seemed long and hard but now looking back on it, it went by quick and we are so glad we pinched all those pennies for those couple years! Thanks for sharing Tracy! Congrats on getting rid of your credit card debt! I’m glad the time seems short when you look back at it. I know the sacrifices will be worth it! The debt snowball strategy really does work! Hi Stephanie. I’ve been following your blog for a while now and I love it! Very inspirational. I live in the Uk and wondered if you had any idea of a comparable app to the Ready for Zero one you mentioned. It looks great but I think it only works for USD. And congratulations on the new baby. WHAT THE HECK DO I DO???? Any suggestions short of hiring a divorce lawyer? So, this is an old question, and idk if you’ll read this, but I had the same problem with my husband. I’d make a budget, and he’d ignore it saying the same stuff as your husband. Eventually I figured I can’t get him to change his spending habits, so I just budget what he typically spends, and cut back on things he won’t notice, like groceries. It’s not perfect, and it’ll take longer to pay off our debt, but it’s not worth it to divorce over. You touched on a really important subject in this post than not many people like to talk about. When it comes to dealing with debt most people don’t want to make all of the necessary sacrifices in order to pay off their debts. Some people would rather sink with the ship than acknowledge they have a debt problem and work their butts off to settle it. Debt denial is a real thing. For some weird reason i had an easy time just ignoring my debt and making excuses, telling myself “Oh I’ll pay them when I have money” It turns out I had always had money and wasn’t prioritizing my debt pay off which is what I should have been doing. So after making the leap and adding up all the debt, I made a lump sum payment from savings and today I have it more than 25% paid off. baby steps.